Hans Grundig was born in Dresden in 1901. Although his artistic career began with an apprenticeship to an interior decorator, Grundig soon switched to the fine arts. In pursuit of this new direction, he enrolled at the Dresden School of Arts and Crafts in 1920. His affiliation with the school was short-lived, however. In 1922, he transferred to the Dresden Academy of Art, and soon thereafter had his first exhibition with Hugo Erfurth, a well-known portrait photographer and dealer in Dresden. Grundig’s paintings, primarily portraits of working class subjects, were initially influenced by Otto Dix, whose studies at the Dresden Academy of Art overlapped with Grundig’s for one year, in 1922. Grundig was no doubt also influenced a great deal by Käthe Kollwitz, who, though not as overtly political as Grundig, was a socialist and committed pacifist. As the 1920s progressed, Grundig’s style evolved. He jettisoned the biting accusations inherent in Dix’s portrayals, preferring to draw the city and its inhabitants as he saw them: simple, forthright and without pity. Grundig, himself a member of the proletariat, was able to achieve only limited recognition during the 1920s. He lived in one of Dresden’s poorest housing units, experiencing first-hand the misery and poverty of the masses. Grundig and Lea Langer (whom he married in 1928) waited endlessly on unemployment lines and relied on hand-me down clothes, which they darned and turned inside out to make them last longer. Often the couple huddled in bed for warmth, sleeping their hunger away during the days. "It was the same for millions of people as it was for us," Lea noted in her autobiography. While Hans Grundig’s work lost some of its critical edge, his sympathetic portrayals gained in descriptive realism. Though struggling at first to survive as an artist, Grundig slowly garnered critical acclaim, and did manage to gain a modicum of success. In 1926, he was selected to participate in the International Art Exhibition in Dresden, the first of its kind to be held in Germany after World War I. Hoping to bring prestige to Dresden and Germany and to revive the lackluster domestic art market, Saxony’s cultural ministry sought out the best German painting and sculpture for the show. Grundig’s work appeared alongside a veritable "Who’s Who" of modern masters, including Marc, Cezanne, Kandinsky, Derain, Degas, Klimt, Modersohn-Becker, Kokoschka, Beckmann, Klee and others. Several years later, in 1929, Grundig participated in "the juryless exhibitions," and exhibited his work at the Stedelijk Museum in Amsterdam. He went on to win the Ilgen Prize that same year. Politically active and socially committed, Grundig joined the German Communist Party in 1926 with his future wife. Along with Otto Griebel, Hans and Lea Grundig co-founded the Dresden branch of the ASSO (German Association of Proletarian and Revolutionary Artists), a component of the German Communist Party’s cultural front, in 1929. The rising politcial turmoil of the late 1920s gradually found its way into Grundig’s artwork. His cityscapes and portraits began to take on ominous tones, with occasional surrealistic, dream-like flourishes. Both Hans and Lea continued to be active in the Communist Party after Hitler’s rise to power in 1933. Thus, they shared the extreme dangers of Nazi persecution, imprisonment and exile. The couple supported one another in their writing and their art. Lea appears as the icon of truth and justice in Hans’ famous anti-war work The Thousand Year Reich (1935-38), while the cover of Lea Grundig’s autiobiography Gesicht and Geschichte (Faces and History, 1960) features a double-portrait of the pair. Lea and Hans also worked closely together as printmakers. Lea pulled impressions for Hans, and he later did the same for her. Hans Grundig made his first etchings in 1933, and went on to create Tiere und Menschen (Animals and People) a politically charged allegorical print cycle that took five years to complete. It now became impossible for Hans Grundig to separate art and politics from his life. He was excluded in 1936 from the National Chamber of Arts (Reischskulturkammer) and issued a "Malverbot" (painting prohibition). Arrests followed in 1936 and 1938. Even as it became increasingly dangerous for Grundig to work, he continued to do so. It was during this period that he created what many consider to be his masterpiece, the aforementioned Thousand-Year Reich: a tryptich predicting, with uncanny accruacy, Germany’s impending destruction under the Nazis. The monumental oil is now housed in Dresden’s Staatliche Kunstsammlungen. Predictably, Grundig was included in the Degenerate Art exhibition in Munich in 1937. A year later, his wife Lea was imprisoned, interrogated and ordered to emigrate. Lea, who was Jewish, fled to Palestine, via Vienna, in December 1939. Hans, as a political (but non-Jewish) enemy of the Reich, was sent to the Sachsenhausen concentration camp, where he remained until 1944. He subsequently joined the Red Army and attended an anti-fascist school in Moscow. After the war, the Grundigs were welcomed back to Dresden and showered with honors. The Communist East German regime officially recognized their work and lauded their efforts to combat fascism and repression. Hans, who returned to Germany from Moscow in 1947, was made Rector of the newly reopened Dresden Academy of Fine Arts (Akademie der bildenden Künste), where he also taught painting. He was reunited with Lea when she returned to Dresden in 1948. Like Hans, Lea became a professor at the Dresden Academy of Fine Arts. 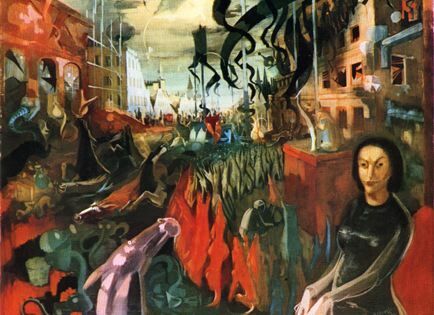 In 1957, Hans Grundig published his autobiography Zwischen Karneval und Aschermittwoch (Between Fat Tuesday and Ash Wednesday), for which he was awarded the Heinrich Mann Prize, a literary award given annually by the Berlin Academy of Art. He lived to see a large-scale retrospective of his and his wife’s work at the Dresden Albertinum. Hans Grundig died in Berlin in 1958.